Whether you’re a die-hard vegetarian, a meat-free Monday-er, or a full-on carnivore, everyone can always benefit from eating a few more veggies. But what if eating your veggies isn’t your main priority? We chatted with More Than Carrots about their picks of the top places to get great veggie food in London when, most of all, you want to enjoy time with your friends. Whether you want to eat outside, celebrate the best of British (including a certain royal wedding, perhaps? ), or grab a bite at a trendy joint, we’ve got you covered! The sun is finally out, so why not dine outside! An exceptionally large selection of vegetarian tapas and a nice garden make this one of our top picks. Spanish food and a glass of wine – feels like a holiday! Street food is just another form of alfresco dining, right?! With a great atmosphere, outdoor seating and lots of food options to choose from, Pop Brixton is the perfect place for diving into the latest veggie trends. We love BaBa G’s Paneer Burger. Maria Sabina’s Mexican street food is next on our list of things to try! For more veggie-friendly Alfresco Dining, click here. It’s the Royal Wedding, so bring on British food! One of our favourites, featuring seasonal, British food and a beautiful (recently refurbished!) garden. Think asparagus, cold soup, rose wine… and don’t miss their chestnut hummus! It’s equally delightful for their high-quality meat as well as their creative, tempting-as-hell veggie dishes! Even though this particular Duke is already married, his pub namesake in London is more than worth a mention here. In a collaboration with Riverford Organics, a farm in Devon, this gastropub serves only the finest of British seasonal cuisine. How about Charred Cucumber as a starter and Ratatouille with grilled polenta and Wild Garlic & Almond Pesto after? Anyone?? Their name doesn’t suggest it, but Roast has quite an exciting veggie offering. We are very intrigued by their Spinach, Pine Nut and Cheddar Scotch Egg. You can have that while enjoying a view of the City in the sunshine and before or after a stroll through Borough Market. And while you’re there: have you tried 3Bis’ Gelato? For more British restaurants with intriguing veggie options, click here. You want to check out one of the trendy new restaurants that everyone is talking about. We love their sourcing policy, which includes ‘often overlooked’ ingredients. It’s a recipe for creativity! Panisse with artichokes and asparagus is high up on our list of dishes to try. The fact that Indian food is great for veggie dishes isn’t exactly a secret. What we love about Gymkhana is that it offers such a large variety of options across different vegetables and cooking methods. 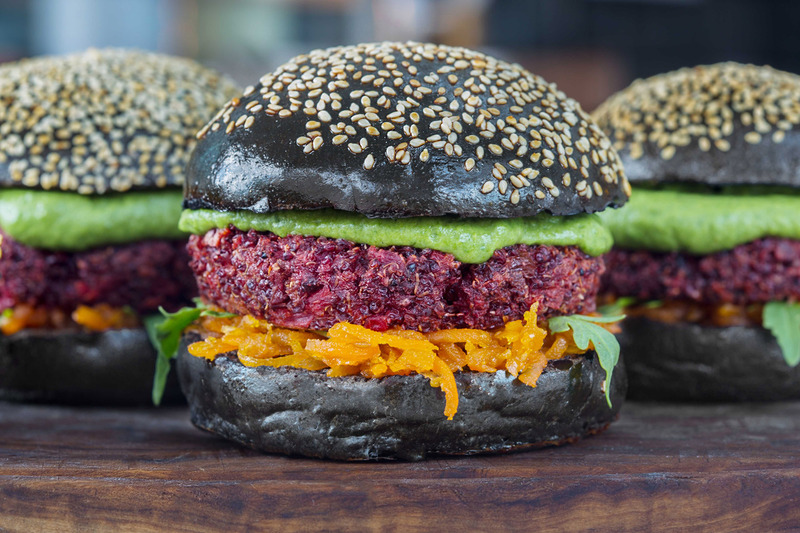 For a longer list of our top 15 trendy restaurants with great veggie food, click here. If you visit one of these restaurants this weekend, we’d love to know what you think on instagram – tag us @team_feedr + @mtcarrots!